oh I so need to take my kids apple picking! I think we're going to be going apple picking next week. So fun and yes, the best part is eating them! What fun! I would love to take my girls apple picking! It's on my TO DO list this fall. Apple picking is so much fun. My family and I are going in a week or so and I am looking forward to it. My kids love picking and eating the apples. How fun, I remember picking them as a kid. I just picked apples last week. I could only dream they were this low lying. Ours were so high I had to knock a lot of them out! Very cute picture! Happy WW! Picking apples is so much fun! What a little cutie pie! Thanks for linking up to my blog today. Have a great week! Wish I could have done that recently. Central Texas isn't really known for their apples so when I was making apple butter last week I had to just give in a buy mine. Hope you get to do something wonderful with those apple besides just filling that cutie pies belly! Thanks so much for stopping by! This is a great blog. I can tell you put a lot of thought and time into it. I love going to the apple orchards. Such a wonderful family time opportunity. Great pic! Happy WW! Very cute! I have to add this to my to-do list for fall! I totally want to go apple picking! Looks like it was fun! CUTE! We love apple picking!! I can not wait to go apple picking! We are going next weekend. That is so much fun. At least he likes to eat them. Looks like so much fun! Love his hat!! Now he knows where apples come from and that's important to teach kids. Great Photo! 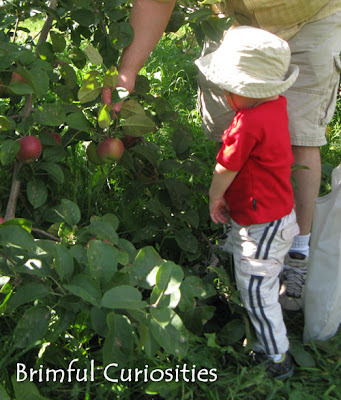 Oh my kids would LOVE to go apple picking. What a sweet picture! I am missing apple picking and all the fun fall stuff this year. Here in FL the apples never taste that good.